Ultimate T-Shirts, online at ultimatetshirts.com, sells the best selection of cartoon, movie, superhero, tv show, and video game themed t-shirts, hats, hoodies, and undies for men, women and kids. 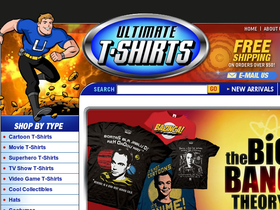 Ultimate T-Shirts ships their orders worldwide. Stop by 58coupons.com for the latest coupons, promotions and discounts from Ultimate T-Shirts. Enjoy free shipping on orders over $50 from Ultimate T-Shirts. Click link and start shopping. Save 10% on your order from ultimatetshirts.com when you use this code at checkout. Follow this link to save as much as 50% on select items at ultimatetshirts.com. Sign up with Ultimate T-Shirts today and save 10% on your next order. Follow this link to get started.